As a young man in this world, okra was a vegetable for which I had the greatest disdain. The slime. The feeling in one’s mouth. The difficult to chew spines. There was a lot not to love about okra and I thought there was no one who might change my mind about that fact. Enter my mother. She had a fondness for okra that I could neither understand nor stomach; not unlike her affinity for eating cornbread and buttermilk from a Mason jar. During my visit to one of her homes in Chicago, I was feeling particularly famished. Mother, always prepared, had a pot of some enticing aroma bubbling on the stove. When I opened the top, I saw my old nemesis, okra, floating there amongst some corn kernels and diced tomatoes feigning innocence. My stomach beckoned again to be appeased. Cautiously, I loaded a bowl with the steamy, deep red brew and began to feed my face. Okra and I have been fast friends ever since this time. After my mother moved to Huntsville and chasing to her home for weekend meal preparation was no longer an option, a pound of okra came into my possession and it recalled to mind the pleasant experience I had with this dish in the past. I sbu oon set about crafting myself a recipe that would allow me to enjoy this okra in all its slimy splendor. The base for this recipe come from Serious Eats and I have made changes and substitutions based upon the desired ingredient ratio. I’m no huge fan of salt, but blending spices and flavors is a culinary joy that is second only to hearing other’s reaction to my cooking experimentation. In this recipe, we toy with spiciness in the form of curry and peppers (red and green bell, habanero). I made the mistake in last making this dish of substituting cayenne for the curry and it made for something far too spicy on the palate. Although I list Spike Vegit as my most profuse seasoning here, most recently I have used Bragg’s Sea Kelp Delight which imparts and interesting near seafood flavor to the stew which works when I am trying to approximate gumbo. Melt the butter over medium heat & add the onions. Sauté until translucent. Add the okra & sauté for 5 minutes, stirring occasionally. 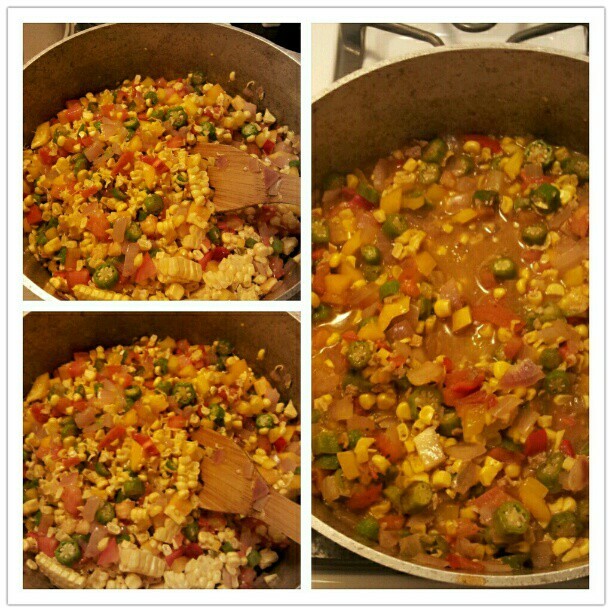 Add tomatoes, corn, peppers, & seasoning; cook 10 minutes or until okra is tender, stirring occasionally. Stir in sliced tempeh bacon. Add 1 cup of water. Lower the heat, cover & simmer for 20 minutes. Season with file powder & pepper. Serve hot over millet. Millet ~ Rinse thoroughly under running water & remove any dirt or debris that you may find. After rinsing, add one part millet to two & a half parts boiling water or vegetable broth. After the liquid has returned to a boil, turn down the heat, cover & simmer for about 25 minutes. The texture of millet cooked this way will be fluffy like rice. If you want the millet to have a more creamy consistency, stir it frequently adding a little water or almond/coconut milk every now and then.